Students and teachers took part in filming at the homeless conference, homeless shelters, and other related events. 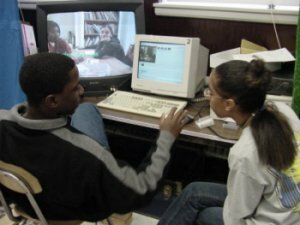 In the process of filming and editing movies, students must use just about every computer skill including advanced editing and graphic techniques, visual design of the movie for such things as titling, chromakey techniques, layering, capturing footage, applying advanced filters to audio and video, and more. The format we filmed in was mini-dv. The editing system was DV Storm RT from Canopus Corp, http://www.canopus.com. The web site was developed using various applications listed below.